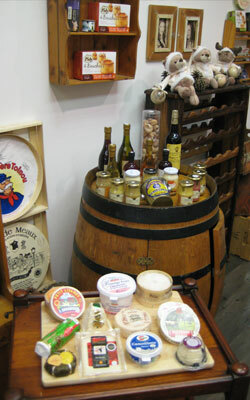 The French Market’s La Crèmerie shop is unique in Cape Town in that it specialises in French gourmet food products, particularly regional French cheeses. The owner carefully selects each product to ensure a high quality and a wide variety of tastes. Over many centuries the French have built up this quality of excellence in their food products and strictly control their production methods and branding. The AOP label (name of origin protection) or AOC label (name of origin control) ensures that the standards of production are maintained at the highest level and that you get each original product with its own unique flavour. New stock is flown in from Paris regularly and alongside the cheeses are a range of typical French ingredients that are indispensable in any traditional French home. No kitchen will be without some Herbes de Provence or Dijon mustard, flavoured vinegars, truffle oils and crème de Marrons to name just a few. The French patès and terrines on offer at La Crèmerie are perfect for picnics or as a treat for those unexpected guests. 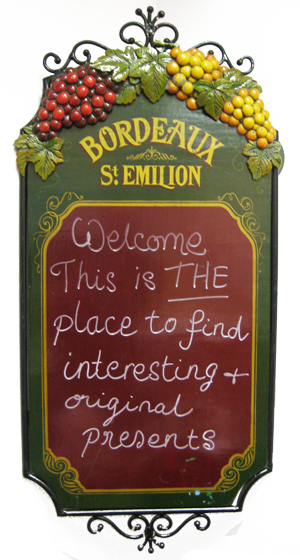 Feel free to visit La Crèmerie and browse the shop’s incredibly unique French flavoured gifts, cheeses and patès. Ask Suzanne for a free taste of your favourite cheese or bring your friends and family along and enjoy the experience of real French dairy shop. How do you start to capture in words the depth and extent of the flavours of French cheese? Each cheese is truly unique. They range from the gentlest, creamiest Brie to an overpowering Epoisses. Cheese is, without a doubt, the greatest export of France. The beautiful fat cows graze in deep pastures ranging from the salty shores on the coast of Normandie, across the vast Massif Centrale and up to the magnificent French Alps. The milk they produce is one of the reasons why these cheeses cannot be replicated because it derives a unique flavour from the grass where they eat; therefore it is truly a product of its unique grazing area. La Cremerie offers you cheeses from across the different regions of France and there is one to suite every palate. Click here to read more about the different types of cheeses on offer or contact Suzanne with your questions. In France there is a deep appreciation of all meat products, generically described under the name “Charcuterie”. This includes all meat products from different animals. No part of an animal is wasted and chefs have created dishes over the centuries using local ingredients which transform the dish into a regional speciality. For example traditional dishes from Gascony will often include the local brandy, Armagnac, and dishes from Perigord will often include truffles. When you walk through a typical market in France you will see the tables loaded with Charcurterie such as Pates, Terrines, Rillettes, Rosette de Lyon, Saucisson sec and Confit de canard. The added herbs, such as tarragon and spices such as nutmeg, give these French products their unique flavour. At the French Market shop, La Crèmerie we stock all of these products. Our range of terrines includes pork, duck, wild boar and game meat. We have stock of Saucisson sec which are small dry sausages with different flavours such as Herbes de Provence or walnuts. Rosette de Lyon is a large dry sausage (like salami) and it comes from the town of Lyon, which is renowned for its Charcuterie. Confit de canard is duck thighs (cuisses) that have been cooked very slowly and then preserved whole in fat which was the traditional way to preserve meat before fridges existed. Rillettes is similar to confit and the meat is cooked until it falls off the bone, then it is shredded and packed in its fat with some mild spices. An example of this is Rillettes du Mans which is shredded pork meat in fat. The French chefs are famous for their sauces which have been added to over the centuries to transform dishes from their original simple recipes to the magnificent French flavours we know today. Many sauces can be very time consuming to make so it helps to be able to buy them ready made. For example at the French market shop, we have a range of sauces including Sauce Bourguignonne, a delicious tomato mixture to add to a grilled steak and Sauce Aioli, a garlic mayonnaise which goes beautifully with a plain steamed fish. Sauce Tartare is great with any grilled fish, everyone knows Sauce Béarnaise and finally the most famous of sauces – Mayonnaise. Any one of these sauces can transform a simple dish into a gourmet meal. The French like to use Dijon mustard with their mayonnaise which gives it a lovely bite and so La Crèmerie also stocks about 10 varieties of Dijon mustard which encompass a range of flavours from green peppercorn to white truffle mustard. Each one is unique and enhances the taste of the dish with which it is used. To create a great dish some of the essential ingredients are good quality condiments, oils and vinegars. For example, vinegar made with white wine is suitable for some dishes and vinegar made with red wine is better for other types of dishes. The French have developed a wide range of herb and fruit flavoured vinegars such as Tarragon Vinegar which is essential for a sauce Béarnaise. The right quality oils are also essential, my favourites are Walnut and Hazelnut oils as they really create a unique salad dressing that cannot be beaten. When selecting a truffle oil, it is always better to find one made with the best virgin olive oil and pieces of truffles. Our truffle butter and truffle salt give a wonderful flavour to simple dishes. Let us not forget the Herbes de Provence, a mixture of fragrant dried herbs from the south of France; Baies roses (pink peppercorns) a mild spice; Piment d’Espelette, a special chilly pepper from the Pays Basque which has a delicate peppery flavour and Sel de Guerande, the salt crystals from the coast of Brittany. Each one of these items brings its flavour and unique character to the dish and can be found at La Crèmerie most of the time. There are many ingredients which are usually found in a French country kitchen; however these are not always easy to find in Cape Town so I have tried to source the type of products that I like to have in my own pantry. Apart from the French cheese, charcuterie and condiments, La Crèmerie stocks delicacies such as organic Marrons (chestnuts) either unsweetened puree or sweetened with vanilla or a range of other flavours. Chestnut forests were planted in the Ardeche region by a wise French king to provide highly nutritious food at a time when the population was starving. Nowadays cyclists and other sportsmen, eat Marrons spread to get a quick energy boost. We also stock a beautiful range of jams and sauces to accompany the cheeses. Our Griottines, (small black cherries) marinated in liqueur make a great present for someone who has everything. In the same range we also stock Cassis (blackcurrants) in liqueur. Serve these over ice cream or in a pastry case with cream to impress your friends. Escargots (snails) from Burgundy and their shells are a traditional French dish; they just need a sauce of butter, garlic and parsley to accompany them. We also have a range of French pulses including Lentilles de Puy, green kidney beans, white coco beans, green lentils and Black beluga beans. These are all highly nutritious and make wonderful vegetarian dishes. And if you enjoy roast potatoes then you cannot miss out on the French duck and goose fat which make the crispiest of potatoes. 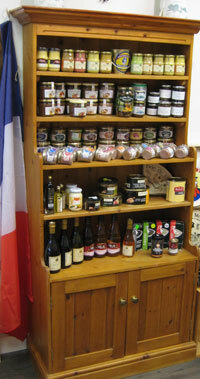 We are always sourcing new stock so just ask at the shop if you are looking for some French treats.